A sweet Harvest Mouse peeks in the window of a cozy home on this adorable card by Agnieszka. I love the warm tones she chose to create this delightful autumn scene. Amy proves that bunnies don't have to be just for Easter. 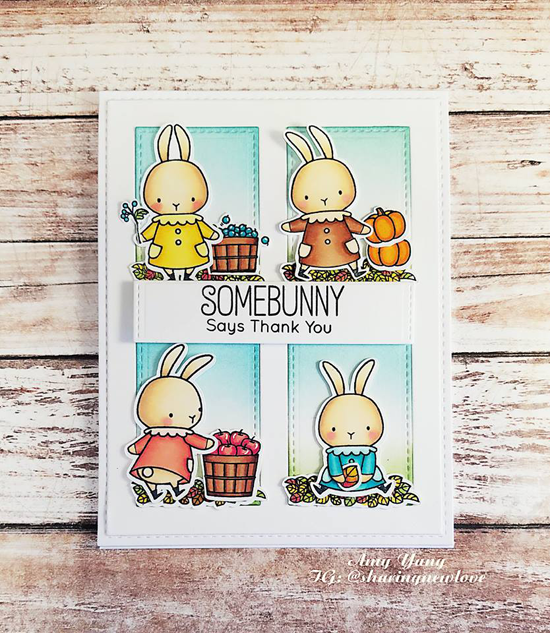 Paired with the thankful statement and detail stamps from the Harvest Mouse stamp set, these bunnies don't look out of place in a fall scene one single bit! Raking leaves isn't a TON of fun, but Toni's card using the Thankful Friend stamp set and Die-namics sure does make it look CUTE! Tanya's card is a festive fall shaker in warm autumn tones featuring the cutest little scarecrow from our Fall Friends stamp set. Such a fun card this is! Of this cute design, Tammy quips, "I might need a Harvest Mouse intervention...I just love these cuties!" We hope she doesn't quit anytime soon, because this is too stinking adorable! Thanks for using MFT, ladies! You've left us inspired, and that's what it's all about! See you tomorrow for another great Sketch Challenge, and look for the next MFT Color Challenge this Thursday, November 24th. Adorable cards!! Congrats on being spotted! !